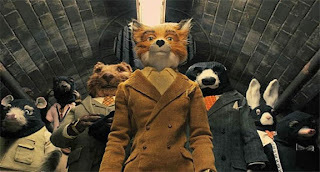 Joining Tim Burton and Spike Jonze on their forays into youthful material, Wes Anderson raids the farm with Roald Dahl's "The Fantastic Mr. Fox". Featuring a knock-out cast of George Clooney, Meryl Streep, Bill Murray and Michael Gambon, Anderson takes liberties with the classic book yet still maintains the wily essence of the original. After renouncing his status as the best thief in the valley, refined family man Mr. Fox (Clooney) pulls off one last heist from the three nastiest farmers in the land, Boggis, Bunce and Bean. His looting goes over a tad too well, with the farmers tearing up the land (and taking his tail as a prize) to get at Fox and his family in an upstairs/downstairs battle. As his fellow evicted animals come knocking in Mr. Fox's bomb shelter our hero must win the day while bonding with his wary son Ash (Jason Schwartzman). After diminishing returns since the success of "Rushmore" and "The Royal Tenenbaums", Wes Anderson comes back with his style and pace seamlessly grafted onto the children's standard. Employing exceptional stop-motion animation from the likes of cinematographer Tristian Oliver of "Wallace and Gromit" and production designer Nelson Lowry from "The Corpse Bride", the fields of Dahl's story are uncannily realised. and the odd knife fight. A great autumn season surprise, and if Hayao Mizazaki or Nick Park (or both!) ever tackle Dahl's "The BFG", my head would explode. Enjoy. It looks great - but I'd prefer it if Wes Anderson made the BFG - especially this scene!